Call Amanda for a quote 9493101131 . This Beautifully appointed (1800 square foot) home has all the amenities you'll need for a relaxing, fun holiday in the mountains. Located at the bottom of Snow Summit Ski Resort makes it ideal for the avid skier, mountain biker or family who just don't want to get back in the car. Walk to the slopes, corner store and much more. 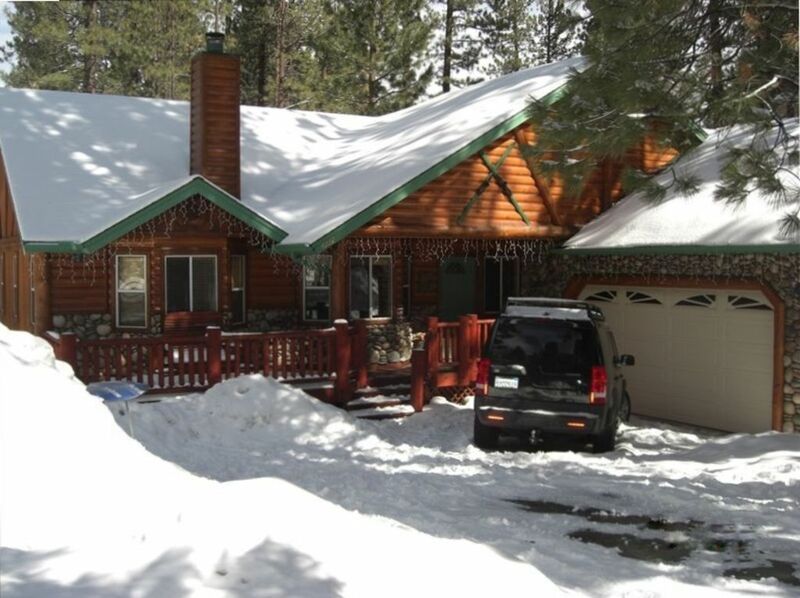 Just 2-5 minutes from the Lake, Restaurants, and all of Big Bear's main attractions. There is ample parking for you and your guests in the large driveway, and we are situated on a flat street. You will enjoy our very open floor plan, fantastic for entertaining. A large 42' TV in the living room with surround sound and a 40' TV in the master suite. We provide free wfi. The kitchen is fully equipped with every appliance and all cooking utensils. Cozy up to a wonderful fire in the living room or master bedroom, take soak in the relaxing whirlpool tub or play an exciting game of Foosball. Go out on the back deck and have a delicious Bar-B-Q while you listen to the wind blow through the tall pines. After a long day of snow skiing, take a soak under the stars in the hot tub. Once you are here you won't want to go home. The Bedrooms have 1 king size bed, A Queen size bed and a Queen bunk with a single bed on top. In the living room there is a Queen pullout leather Sofa, which sleeps 1 adult comfortably. All linens, including towels, blankets and sheets are provided. We bought this house in 2002 so our family could enjoy all the great activities Big Bear has to offer. Our kids love it for the great skiing/snow boarding at Snow Summit and Bear Mountain Resorts. My husband and kids love to go off-roading (we have a Rhino) at Cactus flats and Big Pine flats. My favorite thing to do in the summer is take our boat out on the lake and explore the coves and have a picnic. In the last few years I have also taken up mountain biking, which is challenging but exhilarating among the beautiful scenery on top of Summit mountain. We chose this cabin because of it's Location and family friendly open floor plan living. We are walking distance to the ski slopes and convenient stores. It is great for enjoying games and watching movies together in front of the fire. We love that it is on a flat street for easy parking and getting around. When our kids were young we loved to play in the vacant lot next to our house and the front and back yards. We have built plenty of snowmen and had lots of snowball wars here. Our kids are adults now so they take there own vacations with there friends here to go skiing and mountain biking. I know you will enjoy it as much as we do! Great place! Great location. Great open floor plan. This cabin was perfect and perfect for us. Has the amenities we wanted for three couples and the location for the skiers among us. We are getting it again next year. Amazing cabin right at the foot of Snow Summit! Myself and a few other friends stayed at this cabin for a ski weekend. The cabin itself is gorgeous and we really couldn´t have asked for a better location. Would highly recommend to anyone looking for a good base for a ski weekend! Great location, beautiful home! My family had an amazing weekend! Very nice house, clean and had everything we needed! Great location and cozy home! We will definitely come back! It’s the perfect place for a family to come stay in Big Bear. There was a hiccup upon our arrival because of disrespectful previous renters and the cleaning people needing to stay longer before we could come in, but it all worked out fine and Amanda was very responsive. The smoke alarm needed a new battery, so it was beeping, and she had someone out within an hour to put in a new battery. Overall very satisfied! Great Location and very clean cabin home. We loved our stay and for sure will rent again. Great family cabin. Our teens loved the air hockey and Foosball table. Plenty of room and very clean. We usually spend many nights in the village, yet this trip we played games and cooked in as it was so so cozy. Thanks Amanda!! Your a great Host! Very nice chalet, tastefully appointed and in a great location.